Hi, this is Jacob Sullivan. I’m a recent graduate of Texas State University and archaeology intern working on the 2014 Eagle Nest Canyon Expedition. Today’s efforts focused entirely on Skiles Shelter. The landowner, Jack Skiles, is especially concerned for this site due to the shelters flooding in July of 2010 during hurricane Alex. The day began with a brief introduction to the advanced electronics we will be using for data recording in the field. These included tablets, laptops, cameras, and the Total Data Station (TDS). The team broke up into three groups. The first group was comprised of Vicky Munoz (SHUMLA), Jeremy Freeman (SHUMLA), and Brooke Bonorden. They were tasked with recording datums using the TDS. The TDS was set up on the west rim of the canyon. The purpose was to georeference locations within the shelter. Charles Koenig, Bryan Heisinger, and Dr. Steve Black made up the second group. They worked on removing a substantial amount of sediment which had fallen into unit AB (a 1x2m dug during the 2013 field school), mostly through the process of bioturbation (ground squirrels). Then they cleaned up the unit’s south profile in order to better record the layers of exposed strata. Tina Nielsen and myself began the excavation of unit D (1x2m) as the third group. Our goal was to excavate through the disturbed topsoil until we encountered undisturbed sediment. The only hiccup of the day had to do with the location of our screening station. Initially it was located opposite the tufa mound on the downstream end of the shelter. The team moved the further downslope in order to protect the sensitive rock art, located in the upstream section of the shelter, from dust. In my opinion, the best aspect of today was seeing how well our crew worked together. On the first day of excavation this season I really got a sense of the team’s work ethic and excitement for project going forward. Now more than ever I feel what a privilege it is to be here. The projects Principal Investigator, Dr. Steve Black, took it on the nose today but managed to carry on with a smile. My name is Brooke Bonorden and I am a recent graduate of Baylor University and an aspiring archaeologist. Prior to joining the ASWT team I worked for Texas Parks and Wildlife as a Park Interpreter and also worked for a brief stint as an archaeological field technician for a cultural resource management firm. I am hoping to gain lots of valuable field experience over the next six months, as well as exposure to some cutting-edge approaches to archaeology before attending graduate school in the fall. Today we kicked off the expedition at Skiles Shelter. We began by clearing brush for three “senderos” (Spanish for “paths”) from the rockshelter floor onto the talus slope. The senderos were used almost like transects for Structure-from-Motion Photogrammetry. I have never seen this technique used in archaeology before, from my perspective it seemed that we had rigged two cameras onto a painting rod to shoot photos simultaneously. Put in more elegant terms, though, we were essentially taking a series of overlapping two-dimensional photographs. These photographs will be turned into three-dimensional surfaces using computer software and provide us with a 3-D model of Skiles Shelter. While waiting for favorable lighting conditions to photograph Skiles Shelter, we proceeded to clear brush for a sendero at Eagle Cave so that photogrammetry may be done there as well. When cloud cover returned to the canyon, we went back to Skiles Shelter so that Charles could take the pictures. We also set up a new 1×2 meter excavation unit near a pre-existing 1×2 meter unit excavated by a Texas State grad student. Upon completing these tasks we visited Jack Skiles, the landowner of Eagle Nest Canyon. He gave us a tour of his museum where he keeps artifacts recovered from his land. In addition to prehistoric artifacts (including stone tools, bone awls, sandals, etc. ), Jack also had a large collection of historic artifacts from the nearby railroad construction in the late 1800s. I was particularly impressed by how much of his own family history Jack possessed. He had items labeled as belonging to his “great-great-great grandfather.” I don’t even know who my 3x great grandfather was! All in all it was an exciting start to our expedition, and I’m looking forward to the next six months and all that we will uncover. We will continue to use photogrammetry on Skiles Shelter and Eagle Cave this week and progress from there! Hi, my name is Bryan Heisinger. I am one the interns working for the 2014 Eagle Nest expedition team. I received my degree in anthropology from Texas State University in 2013, and for the last 6 months I have been working as an archaeological technician for the Sierra National Forest in California. Tuesday the 7th of January was a cold and windy day in Eagle Nest Canyon. 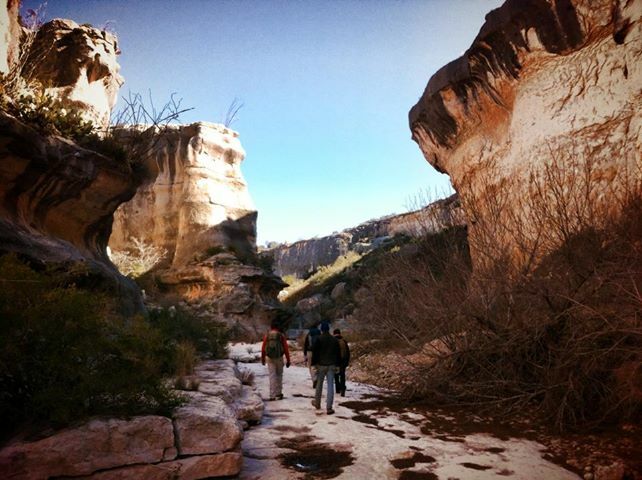 Our objective was to familiarize the 2014 expedition team with Eagle Nest Canyon. This was a great way to break in the new crew to the archaeology of the Lower Pecos Canyonlands. With Steve Black as our official tour guide, the team visited many of the rockshelters within the canyon walls. Throughout the hike Charles Koenig and Steve explained many of the 2014 field season research plans. It was useful seeing firsthand what needed to be accomplished in each of the sites over the duration of the season. We briefly ate lunch in Eagle cave and finished the work day doing prep work for Wednesday. Our visit to Bonfire rockshelter was the highlight of the day for me. It was neat seeing the old excavation units from 1960’s and 1980’s. Overall, it was a great day to learn the history of Eagle Nest Canyon, and an even better opportunity to become acquainted with the new crew. 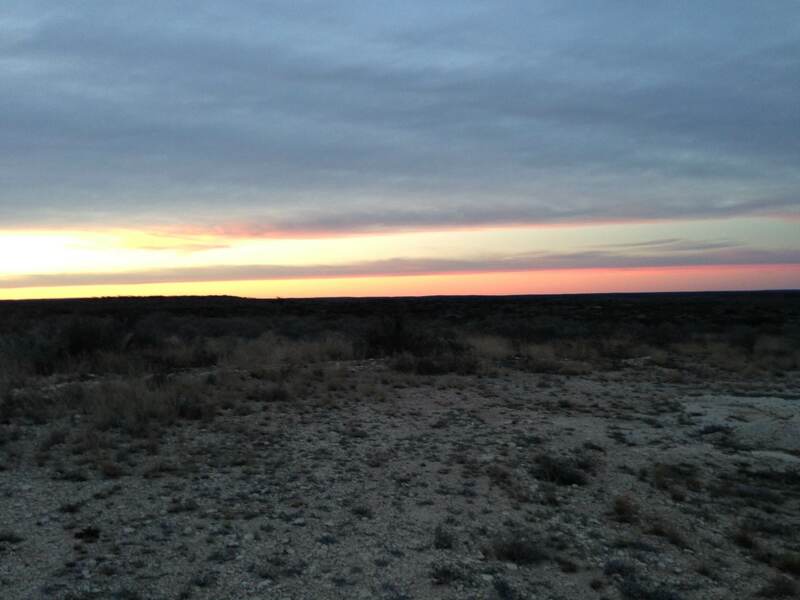 Today marks the start of the 2014 Eagle Nest Canyon Expedition of the Ancient Southwest Texas (ASWT) Project at Texas State University. 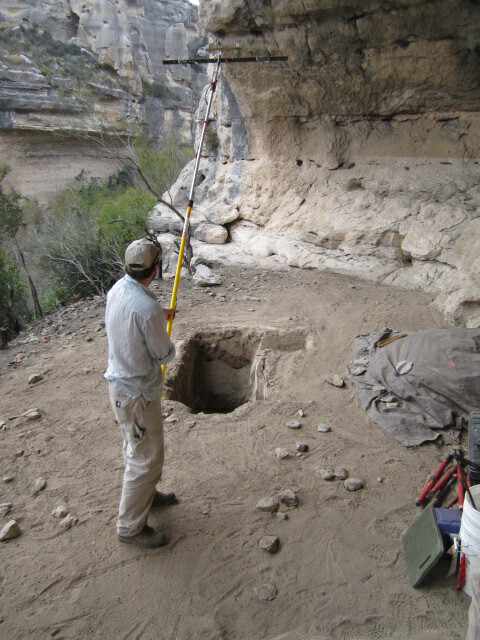 Launched in 2009, ASWT is a long-term research program aimed at furthering the archaeological understanding of the Lower Pecos Canyonlands of southwest Texas. The current phase of investigations is centered on Eagle Nest Canyon (ENC). ENC is a tributary of the Rio Grande entering on the north side of the river just downstream from Langtry, Texas. This canyon and its surrounding upland edge contains numerous sites ranging from dry rockshelters to burned rock middens to upland “hearth” fields, but excavations here and elsewhere in the Lower Pecos have focused on the rockshelters. The Expedition has three overarching research goals: 1) understand the human and natural history of the canyon; 2) share what we learn; and 3), conserve the archaeological record for future generations. This blog will further our second goal. The Lower Pecos Canyonlands region of southwest Texas and northern Mexico is known for its dry rockshelters and caves, which prehistoric peoples used for millennia as witnessed by vivid pictographs and thick deposits of well-preserved habitation debris ranging from basketry and sandals, to food remains and coprolites. Because of the superb preservation within dry rockshelters, much of the archaeological focus has been on these uncommon features. While the dry shelters within the Lower Pecos hold great research promise, comparatively little of this potential has been delivered despite 75 years of intermittent work. No dry shelter has been both well excavated and fully reported. Few state-of-the-art research methods have been applied to shelter archaeology in the Lower Pecos, yet the complexly and deeply stratified deposits and fantastic preservation of perishable materials demand such methods. We aim to improve on this score. 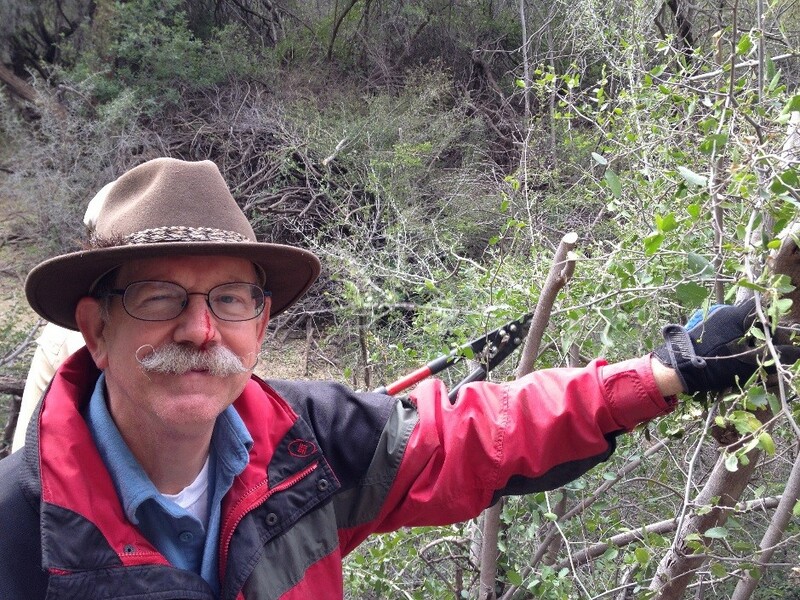 The 2014 Eagle Nest Canyon Expedition is led by Dr. Steve Black and Charles Koenig of Texas State University. The core research team includes Tina Nielsen, Jacob Sullivan, Brooke Bonorden, and Bryan Heisinger. We will be joined by our colleagues Jeremy Freeman and Vicky Munoz from SHUMLA Archaeological Research and Education Center as well as volunteers over the coming months. This field session will run for 6 months – from now until June 30th, and will build on the work completed during the 2013 Lower Pecos Canyonlands Archaeological Field School as well as the Master’s projects of Texas State graduate students Dan Rodriguez (Kelley Cave) and Matt Basham (canyon edge earth oven features). For the next week the ENC team is joined by Rodriguez, Basham and several other Texas State graduate students. Work is focused on helping Dan and Matt complete their field work as well as get the ENC crew introduced to Lower Pecos archaeology. We invite you to follow our unfolding investigations!